On a mobile device, click the white play button. 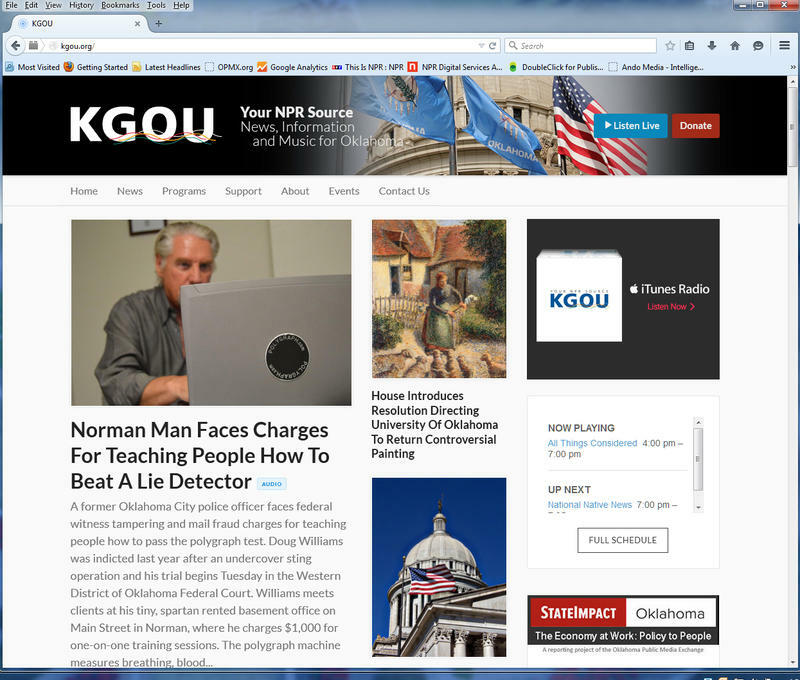 UPDATED Sept. 15, 2016: KGOU has discontinued use of the streaming player described in this article. The current player in use is a product of Triton Digital. For problems, please contact us. UPDATED July 7, 2016: Anti-virus software installed on your computer can interfere with the new player. In particular, Sophos, the software used on University of Oklahoma computers, is known to interfere. If you access KGOU's live audio streaming service on your phone, this upgrade is for you. 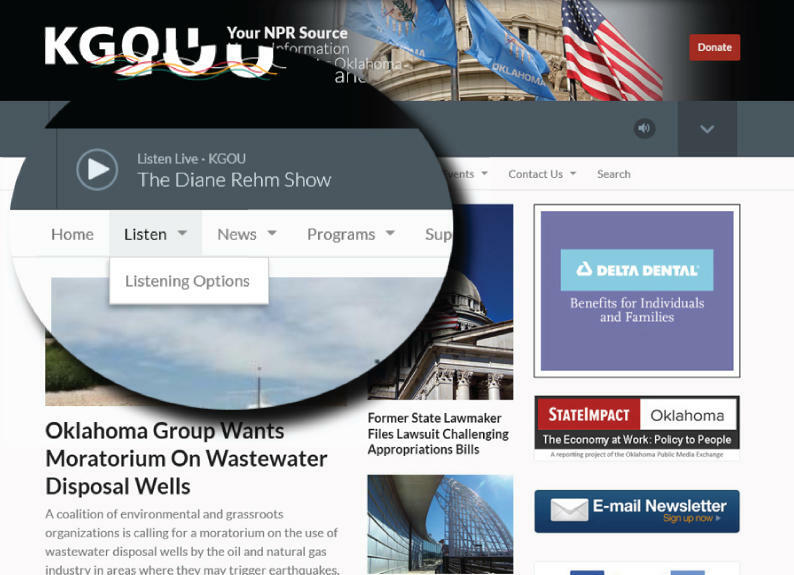 We're launching a new streaming player developed by NPR Digital Services, designed to make it easier to listen and browse KGOU.org at the same time. And you can help us test the new player so we can identify how it works on different devices. 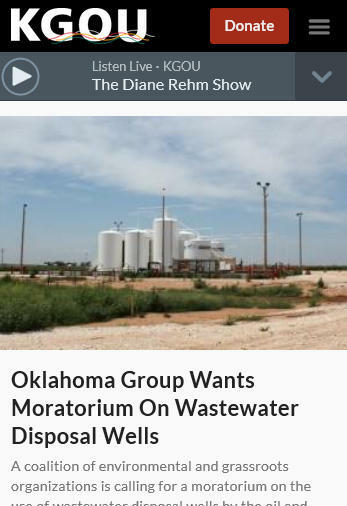 Listening on a smartphone will be easier than ever -- just click the white "Play" arrow under the KGOU logo. Information for the program that's currently playing displays to the right. Test the new player on your phone or tablet, and let us know how it works. We have a quick, one-question poll. The new player is designed in HTML5 to work in all current web browsers. Designing an audio player that works with every single configuration of computing device is challenging, and some might even say it's impossible. So, if this new player doesn't work quite right with your device, you still have all the previous streaming options available. From the navigation menu, select "Listen" and then "Listening Options" to access any of our audio streams that have previously worked for you. Options for listening from your computer. When we tested the player on our own desktop computers at work, we found that it sometimes takes 3 to 4 minutes to start playing. We'd like to know what your desktop listening experience is like, so here's another quick, one-question poll for desktop/laptop listening. If you have time to give us more detailed feedback, please do! Send me an email at membership@kgou.org and be sure to include which browser and operating system you're using. We'll collect all the responses and pass them along for future upgrades. This is from the Manager’s Desk. As we barrel towards KGOU’s fiscal year end, we are not over the barrel because of your financial support. Thank you very much. June 30 is the last day to make your gift at KGOU.org before the fiscal year ends. KGOU's website is in transition today to a more mobile-friendly design, so that all the features available on KGOU.org can go with you wherever you go! This new "responsive" design optimizes the layout of each webpage according to the size of the viewer's screen. The layout on a desktop or laptop computer has just a few changes -- the live audio stream is still accessible from the top of the screen, although now it's on the right side. The navigation bar underneath has just had a little facelift, and the news content flows underneath.